Zionist Union leader says Arab MKs going to UN to have resolution condemning Israel does not rise to the level of treason, not a big deal. Zionist Union MK Avi Gabbay downplayed the actions taken by several MKs from the Joint Arab List who met with UN officials to discuss condemning Israel for passing the Nationality Law. "I do not think this is treason. It's the kind of radicalization that does not serve anything," Gabbay said in an interview with Amnon Sofer and Avichai Zano on Radio 101.5FM. "I am against Israeli citizens abroad acting against the state. These arguments should happen within the State of Israel. Treason has legal implications that I do not think there is treason here. Treason is when you tell the secrets of the state and do things that directly hurt the country. I do not see it as an act of treason," he added. "With all due respect to the fact that some Knesset member is talking to someone at the UN who may condemn the State of Israel, I am not moved. The ambassador to the United Nations and the prime minister are dealing with matters that are not as important as this one," Gabbay said. 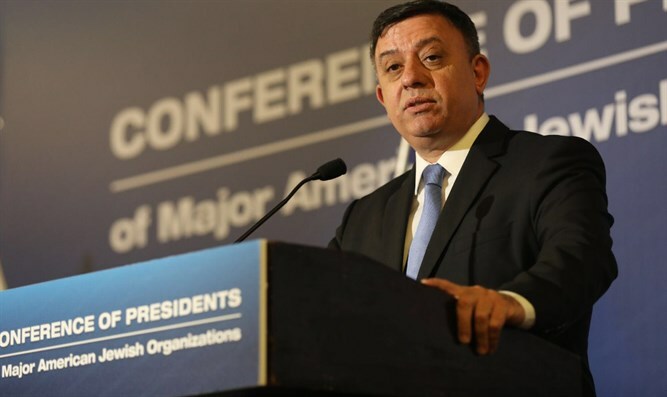 Gabbay's remarks come after a number of MKs from the Joint List met with UN officials alongside Palestinian Authority representative Riyad Mansour and other senior PA officials in order to arrange the passing of the anti-Israel resolution. On Tuesday, Israeli Ambassador to the UN Danny Danon told Arutz Sheva that Israel and the US would add a clause condemning the policies of the Palestinian Authority if the resolution is brought for a vote at the General Assembly.